The cleverly named ‘A Dog’s Breakfast’* is an independent comedy written, directed and starred in by David Hewlett – whom you may recognise as Dr. Rodney McKay from Stargate: Atlantis. In fact there are more than a few cameos from the Atlantis cast including Hewlett’s real-life sister Kate (Jeannie), Paul McGillion (Dr.Beckett), Christopher Judge (Teal’c) and Rachel Luttrell (Teyla) – all in different roles of course! 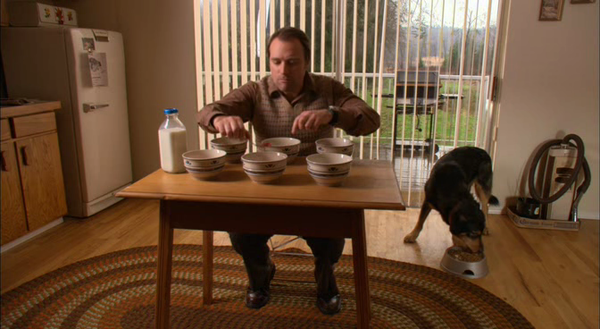 Hewlett plays the obsessive-compulsive Patrick who lives reclusively in the house of his birth and relies on constants in his life to remain stable; these include his dog Mars, his sister Marilyn and the spiders that live outside his sitting-room window. When Marilyn introduces her fiancé, Ryan, Patrick becomes convinced he is trying to murder her and that the only way to stop him is to kill him first! The humour is quite dark and even unsettling in places with elements of psychological horror. The viewpoint is from Patrick’s mindset which is very unbalanced thus creating a good deal of uncertainty. You’re not quite sure where the plot will turn, and with murder as the subject matter your laughter may grow somewhat nervous. But you should relax because this is a real feel-good movie which will make you laugh a lot and ultimately leave you on a high. ‘A Dog’s Breakfast’ is reminiscent of classic comedy like the original ‘Lady Killers’. Taking place in a single location with a small cast it could almost be a stage play. Hewlett plays a neurotic well and has excellent comic timing. This is an opportunity for him to really show off although, in my opinion, McGillion steals the show! Overall it’s witty, clever and surprising. A real treat for anyone with extra special chocolate sauce for Atlantis fans.